When the results started to trickle in last night, the first update, somewhere around 10pm, put him in the lead. But that represented just a few hundred votes out of over 100,000. After two more updates, the Mayor’s lead had disappeared, and the celebration breaking out Vincent Gray’s evening headquarters at the Washington Court Hotel on Capitol Hill was raucous. The tone had been set with just 12,000 ballots counted, and none of it looked good for Adrian Fenty. In the end, Gray would take an eight point lead that put it all out of reach. ﻿At the end of the evening, the results appeared on a hastily written webpage, and Mayor Adrian Fenty conceded to Council Chair Vincent Gray. 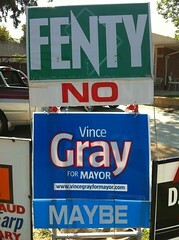 Unless Fenty accepts the GOP’s nomination, something I believe would be deeply unwise, this is the end of Mayor Fenty. Many will cheer that message, in all of the wards of the District, due to Fenty’s abrasive style, his laser-like focus on results alone. Fenty was notoriously bad with the local media, said Erik Wemple of TBD.com, and says that Fenty’s distrust of the media may come back to haunt him in the coming days as we tear apart this election piece by piece to figure out what all happened. Gray was the only challenger to be successful last night, in a late evening of results delayed by counting problems at DCBOEE HQ. New procedures meant some confusion for election workers, and some issues with polling sites at the open of the day meant for some difficult situations first thing in the morning. Procedures were lined up for those situations in which you could not access either their optical scan machine or the single touchscreen voting machine in each polling place, but seemed not to be followed by precinct captains. A court battled waged until the last minute to extend voting hours past the 8pm deadline. We’ll know more about how the vote breaks down in the coming days as DCBOEE fixes the website issues that cropped up late last night but the early results suggested that Wards 2 and 3 had largely gone Fenty, while Wards 5-8 had largely gone Gray. I know that in our Ward 5 precinct (70, East Brookland), Gray won by a 4:1 margin. I’m hopeful we’ll start to see some public shows of support from Gray for a few Fenty appointees, including Cathy Lanier as Chief of Police, and Gabe Klein as director of DDOT, as we get through the next couple of weeks. We’ll start to get an idea soon, I imagine, for what the Democratic nominee has in mind for his new administration throughout the next couple weeks.